This week (February 20-26, 2012) Russians celebrate the traditional festival of масленица. The word масленица comes from the noun масло (butter). Масленичная неделя (Maslenitsa week) is a Russian festival celebrated right before Великий пост (Great Lent). This is the week to be spent eating lots and lots of fattening foods and participating in all kinds of merriment. Once the week is up, Lent begins, with its stringent diet and time for sober reflections. Russians have a saying Не всё коту масленица, будет и Великий Пост (literally: it’s not always a Maslenitsa week for a cat; Great Lent will come soon. Less literally, it means “every day is not a Sunday”). So how do Russians celebrate Maslenitsa? 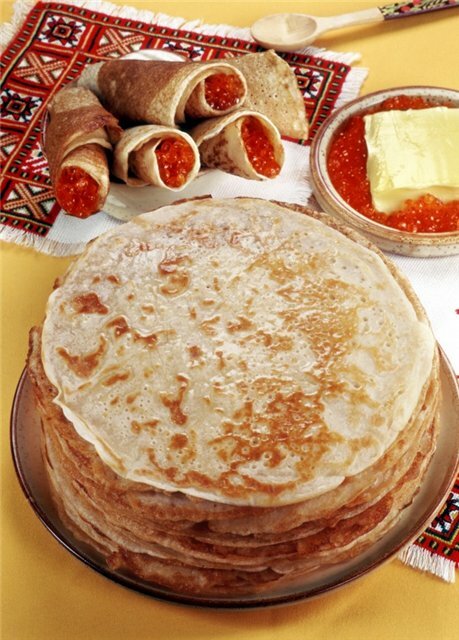 First and foremost, lots of блины (pancakes) are made and eaten. Although the word блин is typically translated as “pancake”, it looks more like the French crepe. The most traditional way to eat блины is with some начинка (filling) and dipped in сметана (sour cream). Here’s a good English-language recipe I found. Just don’t use any мясная начинка (meat filling) since масляничная неделя is also known as мясопустная (without meat). In addition to the traditional pancakes, Russians take to the streets for street festivals. This winter, being bitterly cold and snowy, is particularly well-suited for traditional забавы (amusements), including снежки (snowball fights), sliding down ледяная горка (ice-slides), building снежная крепость (snow fort), and катание на санях (sleigh riding). Traditionally this is also a family holiday, with days set aside for extended families to visit. Each day of Maslenitsa has its own name, including встреча (greeting), лакомки (sweet-tooth), разгул (revelry), and проводы (farewell). On this last day, as the straw effigy of the Lady Maslenitsa is burnt, people would просить прощения (ask for forgiveness) for wronging each other, in word, deed or even thought, during the preceding year. If you plan on celebrating Maslenitsa this year, don’t be discouraged if something doesn’t go as planned. Russians have a good saying первый блин комом (first pancake comes out a blob) which they cheerfully apply to any first-time endeavor that doesn’t go just right. You will have another chance as Maslenitsa 2013 rolls around (March 11-March 17, 2013). Thanks for an informative article! It is nice to know that so many countries have celebrations and carnivals at this time of year.